Disclaimer: In the following post, I'm not affiliated with any of the shops except one. This post is just to inform you about the discounts some shops are having. BeautynetKorea is having a discount that lasts all the way until December 25 (GMT). You get 5% off, then an additional 5% off if you're a member (all you need to do is sign up), so that's a total discount of 10%! You also receive 5% credit and a mini tint from Tony Moly. Alice has decided to give everyone a 10% discount on the entire shop. Just enter W2SALES10 at checkout to get 10% off your order. Plus you get a free sheet mask for every $40 spent, and a surprise gift for spending $150+. Remember that for first-time buyers, you can enter the code 04308009 at registration to receive a $5 voucher which can be used on minimum orders of $30. I'm sure many of you have seen the Christmas collections that many brands have started releasing, and now you can buy them here. Alice has already included Innisfree's and Laneige's, and I'm sure she will be adding many more. You can also buy the new Etude House Princess Etoinette 2013 Winter Collection! There's also a special deal in which you can get the entire Benton set (Aloe BHA Skin Toner, Snail Bee High Content Essence, Aloe Propolis Soothing Gel, Snail Bee High Content Steam Cream, and 10 Snail High Content Sheet Masks) for $75.99. You're saving $25! I know a lot of people have fallen in love with this brand, so this is the perfect opportunity for those who are interested in buying some (or for those who would like to stash a few extras). Cosmetic-Love is having a pretty big sale that lasts until December 1st, and you can get up to 50% off all the products they have. Talk about a good deal. Do we have any Missha fans here in the US? If yes, then good news: Missha is having a 40% discount off all items in their shop until December 25th. Yes, all. I don't know about you, but I am extremely tempted to buy the Time Revolution First Treatment Essence (2013 Limited Edition) simply because it's priced at such a great deal ($37.20 for 215 mL) that you can't even get it for that price in Korea. In addition to the 40% discount, new subscribers receive a M Perfect Cover BB Cream in #13 for free in their first order. The bad news? You might expect a delay in shipping up to 2 weeks during the sale. How about Lioele? Any Lioele fans in the US? For Black Friday, Lioele Texas is providing $5 off purchases of $25+, $10 off $50, $15 off $75, and $25 off $100. Just enter the following codes (shown in picture) at checkout to receive the discount. Last but not least, RoseRoseShop. There's a sitewide discount up to 30%, and for some brands, it's 50%. These discounts last until December 2nd 8 AM (Korea Time). Isn't it absolutely adorable? 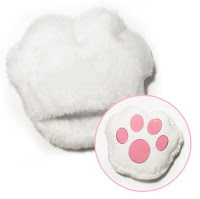 Etude House Cat Paw Stove (sold only at W2Beauty so far) is a feet warmer. This will be perfect for winter since it's downright chilly in California once it starts raining. I hope all of you had a wonderful Thanksgiving, and that you didn't go overboard on shopping (because we all know how easy it is to do that). Now it's time to get out the Christmas decorations and start working on those presents because Christmas is less than a month away!